$14.99 Crestware RBFS Dishwasher Flatware Rack Base 20" x 20"
A practical and economical option, the Crestware REC25 25 Compartment Rack Extender expands warewashing capabilities in any food service establishment. This rack extender quickly and easily changes the height of existing full size glass racks allowing them to hold different size and types of glasses. 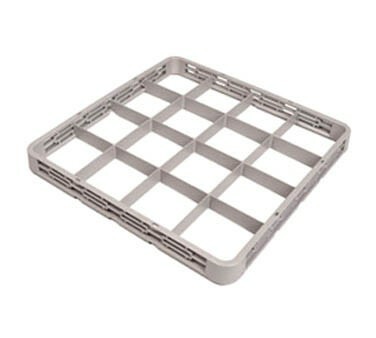 Boasting an open air design, this rack extender allows thorough rinsing during washing and promotes quick drying. For outstanding durability, this compartment rack extender is made from high quality polymer with a scratch-resistant textured surface. Dimensions: 20" x 20" x 23"